Coveted by shoppers of all tastes and preferences, tile flooring is widely regarded as one of the most attractive, versatile flooring choices available on the market. When you visit Foothill Carpet Flooring America, you’ll find an impressive selection of wood-look tile flooring in Rancho Cucamonga, CA. At our expansive flooring showroom, we proudly carry a vast assortment of tile that looks like hardwood floors that offer remarkable appeal and exceptional longevity. Our high-quality flooring selections are designed for homeowners looking to augment their space with the look of hardwood for less. Visit our expansive showroom to discover all of the interior design possibilities that await you. No matter what your flooring material preference, you are sure to find an excellent selection that will meet your every need in full when you browse our inventory. Our wood-look ceramic and porcelain choices offer desirable looks at a merely a portion of their real counterparts. 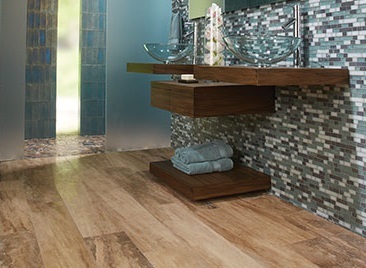 Due to the resilient nature of our wood-look tile and wood plank flooring, even moisture-prone areas of the home that normally aren’t suited for hardwood or ceramic tile floors such as bathrooms or kitchens can take on an instantly recognizable look. All it takes is a single step in our expansive showroom to find a choice that fits your space. Let our dedicated flooring specialists help you find a selection that will leave you with a dazzling appearance that you’ll enjoy year after year. Do you know which wood-look tile would best suit your flooring project? Simply share your design aspirations with our experienced, knowledgeable sales associates, and we’ll gladly help you find a selection that’s sure to meet your aesthetic and functional needs. Whether you prefer ceramic tile that looks like wood, wood plank porcelain tile, or something else entirely, you can be sure that you’ll come away with new floors that are sure to impress. Classic or contemporary, regardless of what you prefer, you are sure to come away with a new flooring surface that you can be proud of for years to come. Contact our specialists to learn more about our impressive selection of wood-look tile flooring. We proudly serve customers in Rancho Cucamonga, Alta Loma, Upland, Fontana, and Ontario, California.